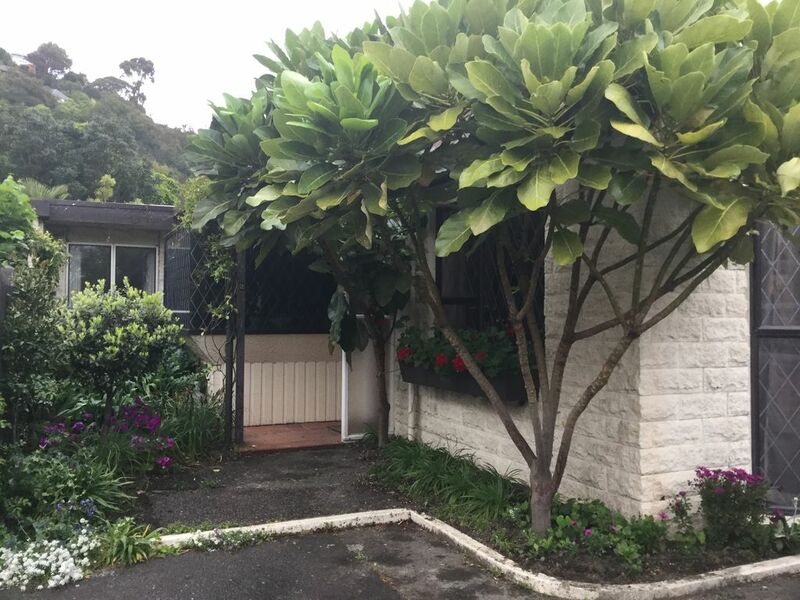 Located in green and leafy Nile Street, this home is centrally located within an easy walk of the best Nelson City has to offer. The property is in a quiet garden setting with views of the Grampians. Guests comment that the house appears modest on arrival but opens up like the Tardis to spacious rooms and a lovely garden. Stylish and comfortable, two double bedrooms with a King bed in the Yellow Room and a pair of king single beds in the Beach Room.. All beds have cosy down underlays, Fairydown Espresso blankets, duvets and are luxuriously comfortable. Described by one guest as 'like sleeping on a cloud'. Beds are made up on arrival, all linen is provided. The open plan living areas are generous with a 'snug' area for quiet activites and a larger lounge area with log fire (firewood supplied) and full SKY digital (over 50 TV channels available) on a 42 inch set with MySky. Most artwork is prints or originals by New Zealand artists. The bathroom has been recently renovated with a separate shower and bathtub. A covered patio area leads from the lounge new Weber gas BBQ and cane hanging chair for reading and relaxing. Other seating around the garden. Guests are free to harvest herbs and fruit in season. Basic pantry items are provided. As dog owners we are pet friendly and welcome well behaved pets. Great dog walking locally and only minutes on foot to 'Girlie's Hole', a famous swimming spot on the Maitai River. Secure garage with auto opener. Two sets golf clubs, petanque set and tennis racquets available. Stay two weeks (14 days) and get two complimentary nights. Smoking allowed only in the garden. Well behaved pets are welcome. The garden is fully fenced with direct access from the garden to the internal access garage. Although we welcome well behaved pets the property is spotlessly maintained for all of our guests. Single garage and off street parking on site. Selection of board games, puzzles, playing cards jig-saw puzzles etc. Lawns from and back surrounded by gardens. On arrival it was raining and the place was very dark. Once all curtains opened it was much better and next day when the sun came out even better. However, overall impression was too dark, but very clean, comfortable and homely and the big bonus was being very close to town. We are bamboozled by this comment. The walls are white and windows plentiful and large. We never leave the curtains closed so wonder if this comment was meant for another property. Was the 2nd time we stayed at this property and had a wonderful time again. Lovely house, very clean and tidy and very well equipped. Lovingly and tastefully decorated. Garden was great for the kids and dog. Will certainly be back. The house is incredibly comfortable. Very well furnished with a large garden. Do you have everything you need in the kitchen and bath for a lovely stay. A lovely space that is very walkable to town. Quiet neighborhood. Home is clean and welcoming with many nice features. Very pleasant property, well located. The centre of Nelson is 5 - 10 minutes walk away, and a large number of good walks around Nelson are directly accessible from the property. Had a great stay at Nile Court! The house was very clean and tidy, and fitted out with everything we could've possibly needed. We loved the outdoor seating area and cooking a couple of dinners on the BBQ. Would love to stay again next time we're in Nelson!